Melco Crown is growing rapidly this year, so why is its stock down? It's been a rough year for gaming stocks, particularly last year's highflier Melco Crown (NASDAQ:MLCO). 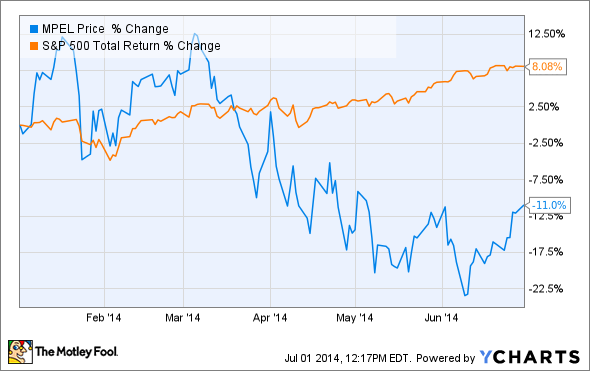 After climbing 126% last year, the stock was down 11% in the first half of 2014 as some of the shine wore off the stock. Interestingly, it's also underperformed Macau rivals Las Vegas Sands (NYSE:LVS) and Wynn Resorts (NASDAQ:WYNN), which are down 4% and up 5%, respectively, in 2014. City of Dreams in Macau generates the majority of Melco Crown's revenue and profits. Source: Melco Crown. One of the major challenges for gaming stocks this year is that growth is slowing in Macau, which is now by far the largest gaming market in the world. Last year, Macau grew gaming revenue 18.6% and so far in 2014 the market has only grown 12.6%. Worse yet, growth has been slowing and was just 9.3% in May and negative 3.7% in June. This slowdown in growth was a challenge for Melco Crown because its valuation got extremely high relative to EBITDA in late 2013. As I highlighted in December, the company's enterprise value/EBITDA ratio was 16.6. So, despite EBITDA growing 42% in the first quarter to $387.5 million, the EV/EBITDA ratio is down to 14.4 right now and the stock is down as a result. A similar dynamic has played out for Las Vegas Sands and Wynn Resorts, but their valuations never were as elevated as Melco Crown's, so the adjustment to slower growth hasn't been as rough. Melco Crown's Philippines resort may hold the key to the stock's growth. Source: Melco Crown. The challenge for the rest of the year and into 2015 will be executing on the expansion plans Melco Crown has. A resort in the Philippines will open this year and is still an unknown commodity, and the market may have gotten ahead of itself in estimating $3 billion in gaming revenue in the region. Studio City is also due to open next year and isn't even approved for table games yet. If it doesn't get approved for the needed casino, it could be a money waster for Melco Crown. Melco Crown hasn't performed poorly operationally in 2014, but a slowdown in Macau as a whole and a high stock price has resulted in a rough performance on the market this year. At 14.4 times earnings the stock still isn't cheap, especially if expansion plans don't go exactly as expected. If you're looking at gaming stocks today, I like the potential growth and value for Las Vegas Sands and Wynn Resorts at EV/EBITDA values of 13.9 and 13.3. They are safer and slightly better values. Melco Crown has upside, but lots of risk ahead as well.